This is the first in this series which I’m writing on request, rather than from my own inspiration. And when a friend told me that they didn’t “get” Joan Miro, I realised that he’s an artist I didn’t know very much about myself. This is a post based on some research, some instinct. 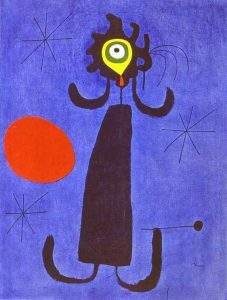 All I knew about Miro before beginning this was that he was a surrealist, which is enough to divide opinions straight away. In fact he was never an “official” member of the Surrealist group (he chose not to be in order to be free to explore more styles) but there are definite links. His paintings aren’t entirely abstract and they do have a subject, but what he does with these subjects is far from conventional. 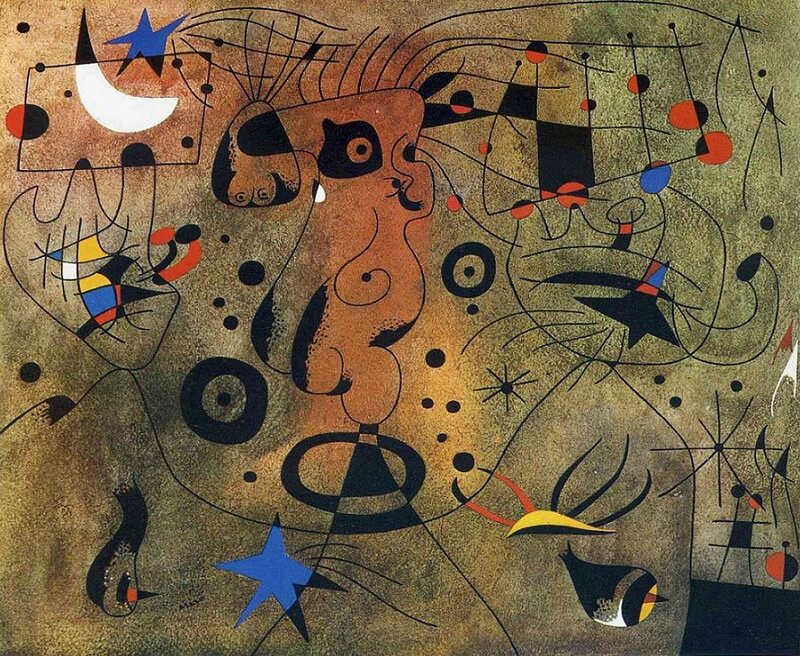 Miro’s style is bold, otherworldly, and hugely diverse. I had no idea exactly how diverse until I started looking through many pages of his works. As this piece is, as I have said before, based on instinct, I’m going to pick 3 of the paintings that I’ve found most interesting on my explorations to talk about. This was painted only a couple of years after Miro first became involved with the Surrealists, and that’s clear. The whole purpose of surrealist art is to play with forms, make us question our perception. So I’m not especially interested in the forms, although I can recognise how the mix of curves and straight lines here is going to crop up in his later works, too. I chose this one because I like its atmosphere. The act of throwing a stone is primitive – but when I see that strange dark sky I can’t help but think of the end of H.G Wells’ The Time Machine, when he turns up at the end of civilization. So are we heading away from this, or towards it? Or maybe he’s expressing a kind of primal sense inside of us? My investigations into Miro’s art have taught me that he depicted women a lot. Woman, Head of a Woman, Woman and Birds…there was a lot to choose from. I’ve chosen to talk about this one for a few reasons. Many of these depictions of women are quite brutal, although I don’t think that’s inspired by misogyny. Miro was greatly inspired by the land, and the idea of “Mother Earth” going somehow wrong would have been powerful in the 1930s and 40s. By 1950 that was over, and this earth goddess is a bit different. She’s still a figure of power – I can imagine her unleashing terror on the world if she chose – but that’s not what she’s doing here. In fact, what is she doing here? Is it a moment of stillness, of prayer, of flight? We don’t know but whatever it is, to me it seems triumphant. The forces of nature have won. 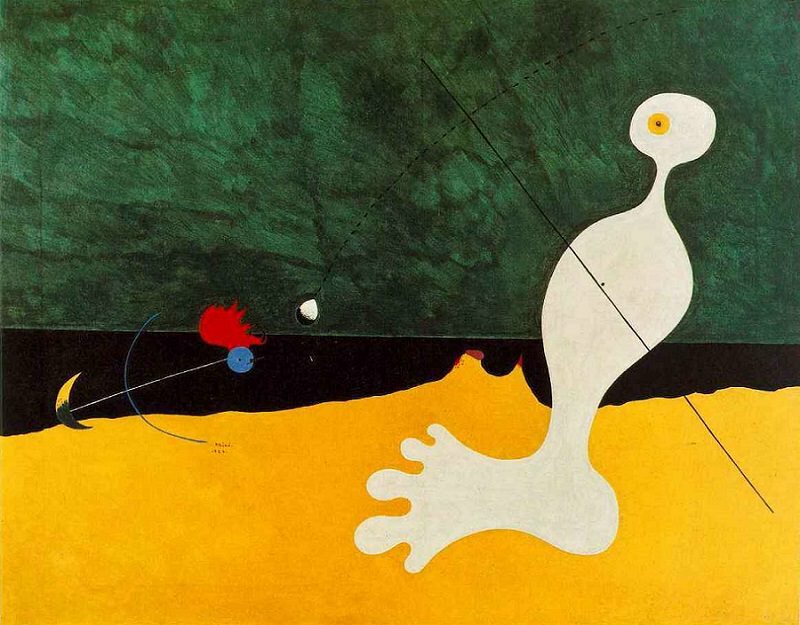 This seems to me to not only be a defining Miro series in the eyes of the art critics I read, but also in the eyes of people who have seen any of Miro’s work. Squiggly lines! Abstract shapes! Strange titles! Miro began painting the Constellations in Normandy after the German occupation of France, and completed in Spain after he had fled. My explorations led me to come across this excellent quote by Miro, written in a letter to a friend, about this series: “I had always enjoyed looking out of the windows at night and seeing the sky and the stars and the moon, but now we weren’t allowed to do this any more, so I painted the windows blue and I took my brushes and paint, and that was the beginning of the Constellations”. If you could retreat into an imaginary world in the face of such horror, wouldn’t you? What would it look like? Blue skies and rainbows would be too easy in a world that had been turned upside down and made no sense. Whether we like it is one thing, but I can understand the artistic urge to try and create a new world as strange and unknowable as the now-hidden skies. I’m personally glad I was asked to write about Joan Miro. It’s been an pleasure to get to know some of his works, and left me curious to find out more about his work and philosophy. This is one of the wonderful things about art: it leads you to discover new ideas, psychologies, and the multiple ways in which they can be expressed. This entry was posted in Home, Let's Talk About It and tagged abstract, art, Art History, artist, constellations, dreams, Miro, painting, Spanish, surrealist, woman. Bookmark the permalink.